Tufts University is investigating the discovery of two-dozen anti-Semitic posters at its campus Hillel Center, an incident the school's president has condemned as "profoundly disturbing and hurtful." 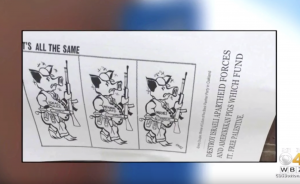 The posters featured militarized pigs, with one especially provocative one showing three pigs armed with ammo and napalm, respectively labeled "local police," "National Guard," and "Marines." It said, "Destroy Israeli Apartheid Forces And Amerikkkan Pigs Which Fund it. Free Palestine." Many of the images date to the 1960’s and the Black Panther Party, but Rabbi Naftali Brawer says some were posted on Hillel windows facing inward, and "we were clearly targeted as a Jewish center." "That’s being investigated. We have no reports of these flyers having been posted elsewhere on campus, only at the Hillel," Tufts spokesman Patrick Collins told WBZ-TV. "We've had incidents similar to this before, but this felt very targeted," Tufts student told Sophie Gelber told the news station. Reporter Gary Brode noted in his report the recent flap in Washington over Rep. Ilhan Omar (D., Minn.), who had to apologize this week for sending anti-Semitic tweets claiming pro-Israel politicians hold that stance for money and are paid off by AIPAC. Another student, Mairav Aloni, told the station some of her more politically active classmates failed to speak up about these instances. "When there are anti-Semitic instances such as this, and there have been others in the past couple of years, all of the sudden these people who are so politically active become quiet, and I think that's really hurtful," she said. "It’s been a really unsettling experience for everyone here at Hillel," Brawer said, according to Jewish Journal. "It shows us that bigotry and hatred are sadly alive and well, even on a university campus. And that only causes us to redouble our efforts to be a place that celebrates diversity, difference and respectful dialogue."